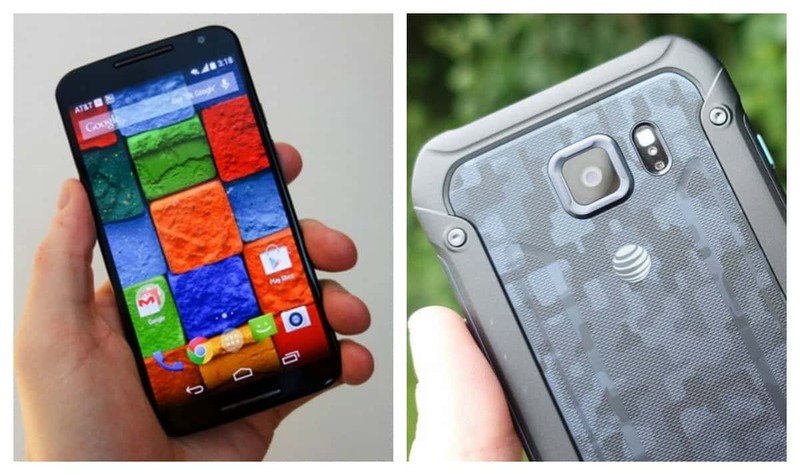 Do we have a good one for you today – the much-loved Moto X (2014) goes up against the new Samsung Galaxy S6 Active? Surely the S6 Active will out power the Moto X, but just how well does the ‘little Moto that could’ compare to the Galaxy S6 Active. The first thing you have to ask yourself is how do you use your smartphone – is it something you slide in your jeans or purse and take everywhere, or are you an avid outdoors person that likes to hike, rock climb or camp out? Once you answer that question, then it will be easier to answer which one of these two great devices should be your choice. The Moto X may not have all of the newest technology or specs, but it does offer a tremendous value. There are not too many similarities in these two smartphones, however, they are very similar in physical size and the displays are almost identical in size – 5.2-inches on the Moto X and 5.1-inches on the S6 Active and they both use the AMOLED display technology. Both devices have 32GB of internal memory and expansion is not possible in either. Only 3MPs separate the main cameras – 13MP on the Moto X and 16MP on the S6 Active – however, after that, there is a world of difference leaning in the S6 Active’s favor. Both have non-removable batteries – 2300mAh in the Moto X and 3500mAh in the S6 Active. They both have the usual dual-band Wi-Fi, Bluetooth (4.0 in the Moto X and 4.1 in the S6 Active), GPS, NFC, active noise cancellation microphone, quick charge and a microUSB v2.0 port for charging and data transfer. The Moto X 2014 is an update of last year’s popular Moto X, upgraded it in all areas of size and specifications, and Motorola did it all for a great price – they finally made the Moto X a real flagship of their line, while reserving the mid-range area for the Moto G and the Moto E as their entry-level smartphone. 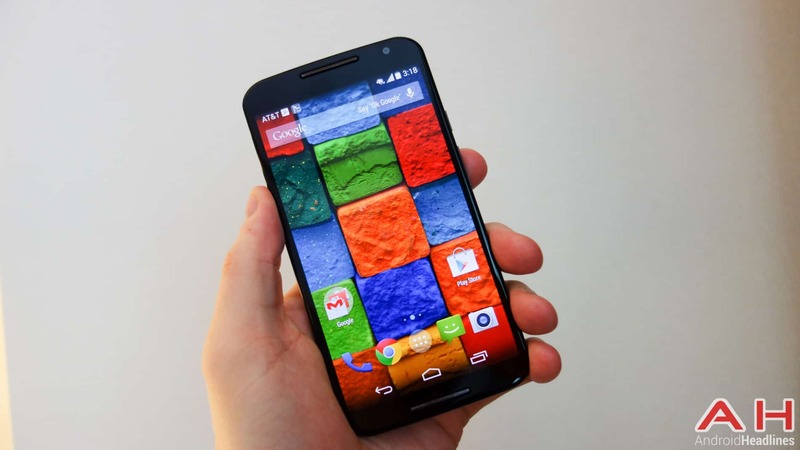 The new Moto X is comfortable to hold and has that well-built, premium quality we all look for in a smartphone. The display is now within that ‘sweet spot’ at 5.2-inches and it uses the AMOLED technology with an FHD resolution of 1920 x 1080 pixels and a respectable 423 pixels-per-inch (PPI), but still a far cry from the QHD display and 576 PPI on the S6 Active. Motorola included the best processor out at the time – the 64-bit Qualcomm Snapdragon 801 quad-core clocked at 2.5GHz. Motorola has optimized the device and by running almost pure Android, it flies through its tasks with a quickness and smoothness not always found on Android devices. This is in contrast to the 64-bit Exynos octa-core processor in the S6 Active – the first one to use the 14nm technology. It only has 2GB of RAM, but that is all it really needs, whereas the S6 Active needs all of its 3GB of RAM. The Moto X started out with a 16GB, 32GB and there were talks of a 64GB available only on AT&T – however, at this time you can only find the 16GB online – and no microSD card slot here to expand. The S6 Active has one option…32GB and no expandable storage. Motorola and Google believe that your data should be stored in the cloud, not on your device, in order that all of your devices will have access and share that data. Motorola has never been very concerned when it comes to the camera on past smartphones, but with the Moto X 2014 they put in a very good 13MP sensor, autofocus and a dual-LED Flash Ring that encircles the lens – still no OIS, but it does take decent photos. This compares to the 16MP camera in the S6 Active that will take some of the best pictures of any smartphone today. The ‘standard’ 2MP front-facing camera (FFC) is fine for social selfies or the occasional video chat with friends or family, but does not compare to the 5MP wide-angle, f/1.9 aperture FFC on the S6 Active. Moto definitely likes to use smaller batteries in their Moto X series and that continues with a 2300mAh battery powering the Moto X…small or not, it will get you through an entire day of normal usage. If it is a heavy day of use and you need more power, just hook it up to the optional Turbo Charger for up to 8 hours of battery life in just 15 minutes! As far as extras on the Moto X – Motorola used four microphones for excellent noise cancellation and voice reproduction on phone calls, they also added front-mounted speakers, used a full metal frame for strength, nano-coated the inside for water resistance, and engineered Dynamic Tuning to help increase the radio strength. It is running 5.0.1 Lollipop and is available on Verizon, AT&T and T-Mobile, all for only $50 on a two-year contract and only $500 – $550 off-contract. The Galaxy S6 Active is not your normal Galaxy S6 – gone is the pretty glass and metal body and replaced by shock-resistant plastic that looks like you put a plastic case on your Galaxy S6. It is there to protect your device from drops and most damage – and to add to its ’ruggedness,’ it is done using three camo colors…blue, white and gray. Most of the technology of the S6 is ported over to the S6 Active, but are a few changes – gone is the fingerprint sensor and capacitive buttons, which are replaced by three physical buttons. There is also a programmable button on the side that is set for the Action app, but you can change it to operate the camera, for instance. The Activity app is designed for the camper or hiker and immediately brings up a menu with a flashlight button, the weather, compass and other features an outdoors person might need to use. There are some added benefits as well, such as IP68 certification for dust and water resistance and a MIL-STD-910G certification, which means it is resistant to salt, dust, humidity, rain, vibration, solar radiation, transport and is thermal shock resistant. Much like the Moto X’s 5.2-inch display, the Galaxy S6 Active shares the S6’s Super AMOLED display and comes in right at 5.1-inches, but uses Quad HD (QHD) resolution of 2560 x 1440 pixels and a whopping 576 PPI, as opposed to the 424 PPI on FHD display on the Moto X. As part of their new philosophy, Samsung dropped the Qualcomm 810 processor altogether and opted for their in-house 64-bit Exynos 7420 octa-core processor. It has four cores clocked at 1.5GHz and four cores clocked at 2.1GHz. It is packing 3GB of much faster DDR4 RAM – a step up from the 2GB of DDR3 RAM used in the Moto X. It also comes with Samsung’s new, faster, UFS 2.0 flash memory offered in only 32GB with no room for expansion – a first for Samsung’s Galaxy S series. This matches up to the 16GB of storage in the Moto X, also with no expansion capabilities. The camera Samsung put in the Galaxy S series is quite possibly the best camera currently on a smartphone. It is using a Sony/Samsung 16MP sensor, autofocus, LED flash, a wider f/1.9 aperture, Live HDR and OIS. The speed was dramatically increased – taking only 7/10s of a second to open and be ready to shoot. The front-facing camera increased to 5MP with and added the f/1.9 aperture, Live HDR and a 120 wide-angle lens for excellent low-light selfies and video chatting. This compares with the 13MP (no OIS) main camera and 2MP FFC in the Moto X. The 3500mAh battery is much larger than the 2300mAh in the Moto X, and should easily get you through almost two days – the new Samsung non-removable battery can charge for up to 4 hours of usage in only 10 minutes and they also added built-in wireless charging for the first time. The Galaxy S6 Active has a large speaker on the back of the device and comes with a heart rate sensor, IR Blaster along with active noise cancellation. It will be running Android 5.0 Lollipop and pricing on a two-year contract will probably be about $200, and $695 full-price. This is so tough to pick because the Galaxy S6 Active wins in every specification category, it would be so easy to slap ‘the winner’ on its back and walk away. However, because the S6 Active is a ‘niche’ device and the Moto X is the type of device that anybody could use as their daily driver…while saving almost $200…it makes it a lot tougher to pick a winner. They both have great software, but the Moto X is almost pure Android and Motorola has been pushing out fast updates, while Samsung doesn’t seem to be in that big of a hurry. The S6 Active has so much going for it – QHD display, much faster 64-bit processor, more and faster RAM and uses faster UFS 2.0 Flash memory, much better main shooter and FFC, IP68 certification for dust and water, military spec MIL-STD-810G, wireless charging, larger battery, IR Blaster and heart rate sensor. However, the Moto X is comfortable, well-built and comes with a beautiful FHD display, is water resistance, a great 32-bit Snapdragon 801 processor, which has been optimized for the Moto X, 2GB of RAM, a decent camera and fast battery charging. With that being said, the Galaxy S6 Active will cost you about $695 off-contract and the Moto X will run you about $500 – $550 depending where you purchase it…and it appears that 16GB is the largest you can purchase. 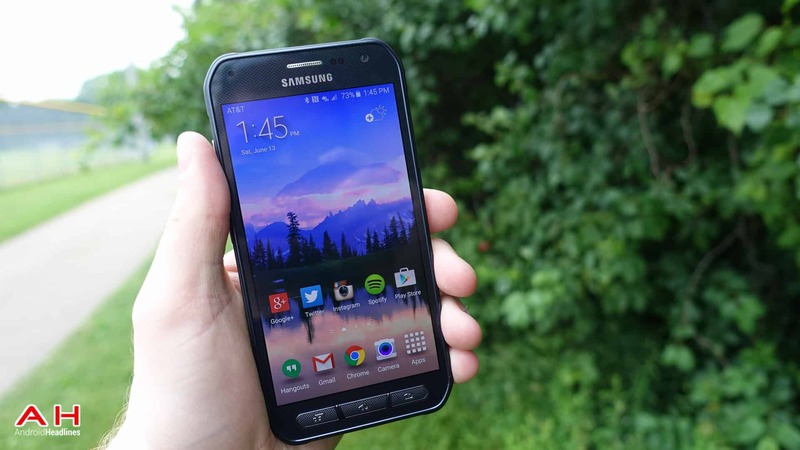 Like so many others that we have compared with the Galaxy S6 Active, it depends on how you use your smartphone. Without question, the S6 Active is clearly in another class than the Moto X when it comes to specifications, but as a daily driver, the Moto X is a great combination of style, substance, usability and a cheaper price. You pick your winner. 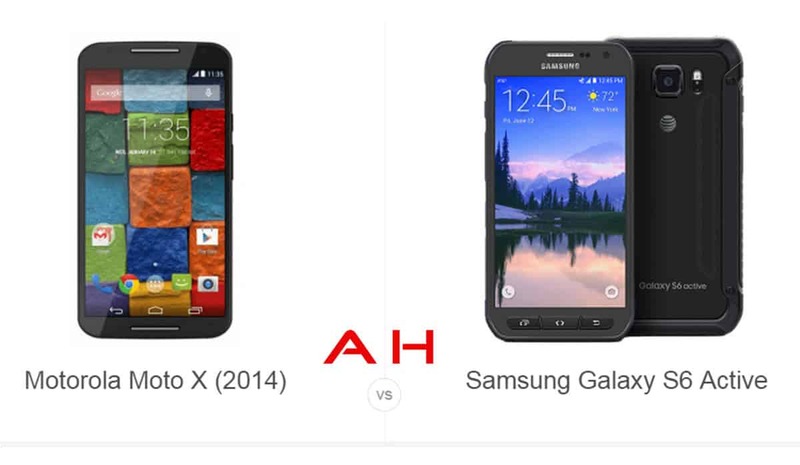 The post Phone Comparisons: Motorola Moto X vs Samsung Galaxy Active S6 appeared first on AndroidHeadlines.com |.